Compatible: Fit for Oral-B D12013 D12013W D12523 D12513.K DB4510 DB4010 DB4510.K D16.523U D20.545 D20.523 OC20, and Pro 600/650/1000/2000/3000 etc. 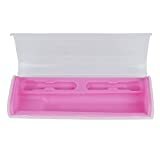 Material: Plastic outer box and food grade silicone inner tray, silicone can be removed for cleaning. Practical: Lightweight and compact size convenient to carry. Well made for travel, camping, hiking or business trip. 1. For sale is 1pcs pink color case only (device and accessories are sold separately). 2. Fit for a toothbrush and two heads perfectly ,can’t hold toothpaste and charger. Compatible for: Oral-B electrictoothbrushes D12013 D12013W D12523 D12513.K DB4510 DB4010 DB4510.K D16.523UD20.545 D20.523 OC20, and Pro 600/650/1000/2000/3000 etc. This entry was posted in Dental Shop and tagged 1000, 3000, BagPink, Carrying, Case, Diamondsmile, Electric, Heads, Oral, Plastic, Portable, Toothbrush, Travel, Vitality by Oral Health Care. Bookmark the permalink.